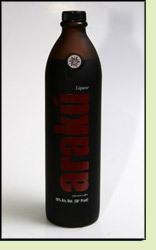 Andy: Araku has a very strong authentic coffee flavor. It’s good, but if I had a choice, I would still pick the Brinley Coffee rum. It has a much higher alcohol content but you can’t tell and it is a little sweeter. If you can’t find Brinley, it’s a decent option. Adrian: This isn’t bad but I would prefer it to have a little alcohol flavor to it. It tastes like a coffee syrup. Not bad.